It’s the Division One conference championship game. The stakes are high and the pressure is on. Everything is going great and then BOOM! You make a key error and now your opponent has the momentum. Am I letting my team-mates down? What is my coaching thinking of me? What are the scouts in the stands thinking now? Depending on what level of ball you’re playing you could be having one or all three of these thoughts going through your head after something like this. 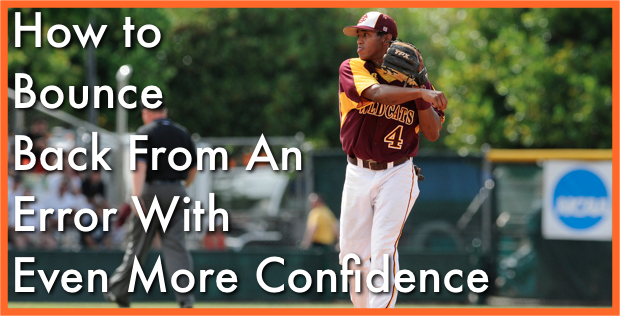 I have 3 baseball tips that will show you how to deal with any baseball adversity so you can respond to any error in a more effective way and avoid allowing your performance slip. 1. Become aware that you have a choice. Whether you’re still training your bat-speed to hit like Bryce Harper or master the art of hitting the baseball the other way like Derek Jeter, I want to hear from you.